An introduction to tech groups and how they relate to request types in Web Help Desk. In this video, I'll show you why you would use a tech group and how they relate to request types. For tickets with a request type that is not in a tech group, the "Lead Tech" for that request type is set as the assigned tech. For tickets with a request type that IS in a tech group, the assignment is set according to the"Auto-Assign Tickets”of that tech group’s Level 1 setting, after filtering out other factors of the ticket if applicable. If you have a small help desk team with 1 to 3 techs and each person has their own specialty, then you may not need tech groups. In this case each of your techs would be considered the 'Lead Tech' for that request type. For larger teams, you may have more than one person capable of taking each request type - for example, an HR team and Facilities team, or your Systems groups and your Network group. If you would like your techs to be able to see all tickets for their functional group and possibly work on their colleagues tickets, then you want to use 'Tech Groups'. A tech group is designed to be a group of similar request types handled by a group of techs. For example, in this screenshot, we have an "IT" tech group, with all request types and techs that work on these requests. Another example is a "Facilities" tech group, with all facilities maintenance request types and the techs that handle these requests. In our example, we have several offices in the Boston, Chicago, and San Diego areas that we defined as Locations. Now I don’t mind the techs in the IT tech group handling tickets from other offices, as most of the issues can be handled remotely. However, this would be a different situation for the Facilities techs. So what I will do is create Location Groups named Boston, Chicago and San Diego. Then add all the Boston area locations to the Boston Location group, Chicago area locations to the Chicago group, and San Diego locations to the San Diego group. To ensure that all my IT techs can see all IT-related tickets regardless of the location, I'll assign them to ALL the location groups. But I will assign the Facilities techs to only the location group that serves the offices he or she is responsible for. That means, Bill, who is a facilities tech located in Chicago will only be assigned to the Chicago Location group. 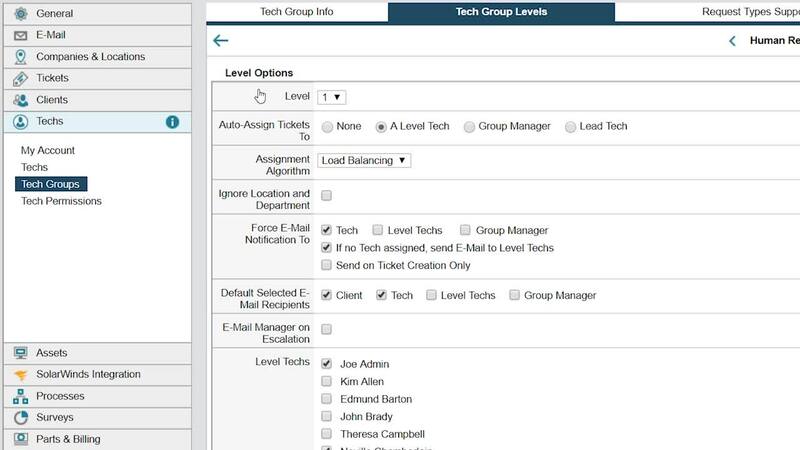 When a ticket comes in, Web Help Desk will filter the techs based on the request type, which determines the tech group and tech group level. Then it will look at the location of the client on the ticket and use that to filter out which techs are eligible based on the location group membership. If "Auto-Assign Tickets“ is selected, then it will automatically assign the ticket to the correct tech group. Otherwise, it will assign the ticket to the tech group manager. This is the joy of using tech groups. It removes the need for a supervisor or administrator to read each ticket and determine who to assign it to.